Anyway, two years later, the band release a follow-up EP called “Dark Chamber Litanies”. Thanks to Adrian Butler from Lugga Music I could review that release, which you can read here. Needless to say it’s always nice to do some follow-up reviewing. 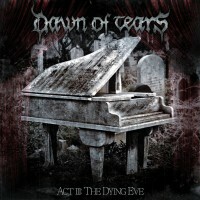 The EP proved to be a very nice piece of Metal, showing that DAWN OF TEARS very much deserve their place on the Metal map. Many gigs and lots of silence later – it seems the line-up changed once again between 2009 and 2013 – the Spanish return to the front with a new album and a label deal. The new album is “Act III: The Dying Eve”, the label that released it in October 2013 is the Finnish Inverse Records. With this new deal the band should be able to reach a larger audience, and obtain more gig requests and bookings. “Act III: The Dying Eve” is not a happy album, even if sometimes in Melodic Death Metal you can find more aggressive, uptempo tunes that re-energize you. But the title alone indicates the dark and sombre atmosphere of the new songs. As does the cover, with the piano and graveyard. It all starts with the atmospheric intro of “A Cursed Heritage”. Tension is built with Metal bursts and symphonic backing, after which full action takes place. This piece, the pounding Melodic Death Metal, returns later on. The verses are straight-forward with Alonso’s typical aggressive vocals. A slow, melodic bridge (or pre-chorus) is the second important part of the song, as is the midtempo, melodic chorus. A second bridge, this time symphonic with female guest vocals (by Mar Cabello), comes in to break the pattern a little. The obligatory solo moment is pushed onwards by rapid drumwork, though with variations in rhythm. After that, it’s back to business and conclusion of the song, which is a very nice one to begin this album with. Oh, how nice, a xylophone (probably via the keyboards) playing the main melody (and coming back in the chorus). In fact, it’s the chorus line in the beginning of the track. However, those Poppy drum samples are far from my liking, to be honest. The leadwork itself adds a Gothic (Metal) touch to it. The tempo remains intact as the verses are due, they being quite solemn, yet with screamy vocals. But in a next instant, the Metal kicks in to add a more aggressive touch. The chorus, this time with real drums, also features Mar’s vocals as small contribution. The music expresses nicely the drama, the sadness in the lyrics. A melodic side-step leads to the solo part. Overall, the contrast between this song and the first one cannot be denied. And yet, as good as the song is, I found it not as strong as the first one. But then there is “Lament Of Madeleine”, which takes off with direct, pounding melodic Metal. The verses are driven by atmospheric keyboards, adding a touch of mystery, but soon enough the fast-paced Metal takes over again. Contrasting with that is the melodic chorus, in which keyboards/organ are dominant. Female backing vocals are of course a must. The solo part is split into two: slow at first, then rapid. Afterwards it’s back to business and ending with a bang. Another highlight is “The Darkest Secret”, beginning with a string/symphonic intro, joined by the organ. A solemn way to start a song, but let it be clear that heaviness soon kicks in, in a Thrashy manner. This style is quite dominant in the song. The verses are slow and emotional (mainly due to the vocals). Things shift from melodic to more Thrashy again and so into the emotional chorus, where Mar can be heard in the back. While it’s a very good song, I found it hard to distinguish its different parts: what exactly is verse, what is chorus, bridge…? Also, while the music is good for such a dark song, the screams begin to annoy. In “Silent As Shades Are” DAWN OF TEARS opts for a more Gothic approach. The piano is more prominent, especially in the intro, and overall, melodically, the song reminded me of DARK TRANQUILLITY’s “Therein”, especially the clean bit of that song. Like before, DOT relies heavily on Alonso’s ever-present screamy vocals, while keyboards linger in the back and guitars lead the way. When female vocals come in, the rhythm changes, and the music sounds more held back. This is also the case in the solo part, preceded by the DARK TRANQUILLITY melody. The chorus is, once more, quite emotion-laden, followed by a Metal-laden bridge. All in all it’s good, yet not as strong or attractive as some of the other tracks. The same can be said about “Angel Gone”. Here you’ve got a symphonic intro, building, with Metal accents, venturing off into dark, melodic Metal, led by the piano. This is the chorus part. Firm verses form a nice contrast with this. Later on, an acoustic break allows for some rest, in preparation of the upcoming solos. The last three tracks can be counted among the highlights, in my humble opinion. “The 7th Seal” also begins with a symphonic intro that leads into rather slow, melodic Metal. The verses, however, are blasted out of the speakers! Take about a turnover! The bridge is heavy, yet melodic, while the melodic chorus is also played in a solid fashion. A theatrical twist makes the song a little spookier, give it extra spice. And that’s good. Afterwards it’s solo time and back to business to round everything off. “Oceans” brings in the acoustic guitar, for the entire song this time, and at the same time the Spanish stamp is set. Symphonics create the right atmosphere and increase the melodic input. The song itself is fully instrumental. DAWN OF TEARS showed a few years ago the potential they had and why the world should like them, or at least, their songs. However, whereas bands like DARK TRANQUILLITY (since DOT were often compared to their Swedish colleagues) offer variation in singing, this is an aspect that DOT could also use or apply more. While Alonso is a good vocalist, the amount of screaming on this new album is a bit too high (maybe that partly explains Mar Cabello’s presence), I must admit. But maybe it’s a matter of taste. This detail aside… With “Act III: The Dying Eve”, a dark title with songs and music that match this kind of atmosphere, the Spanish created an album that is enjoyable on practically all levels, sound-wise and composition-wise (I like the changes here and there, as well as the theatrical touches).